This is an analysis of the Optimal Risk for my y48 system trades, calculated as per the Kelly Criterion. I have been trading the y48 Trading System since May 28th. The details and statistics of the y48 trades are available on my Trading Stats page. The Green Line shows how the Optimal Risk varied for Long Trades. The Red Line shows how the Optimal Risk varied for Short Trades. The White Line shows how the Optimal Risk varied for All Trades - both Long and Short. The Optimal Risk as per Kelly Criterion is calculated based on 2 parameters - the Win Rate, and the Payoff Ratio. The Optimal Risk is percentage of capital to be risked to maximize capital gain. I had posted earlier about the Kelly Criterion. The continuously calculated value of the Optimal Risk has varied drastically since May 28, as seen in the chart. So, as of today, if I expect the performance of the y48 trading system to remain the same as since May 28, I should optimally be risking 18.35% of my capital in each trade. Ideally, if I had risked this Optimal Fraction for all my 64 trades from May 28 to Aug 03, with a 50% Win Rate and Payoff Ratio of 1.58, my Return on Capital would have been 426%. Even better, if I had risked 11.69% of my capital on each long trade, and 28% of my capital in each short trade. 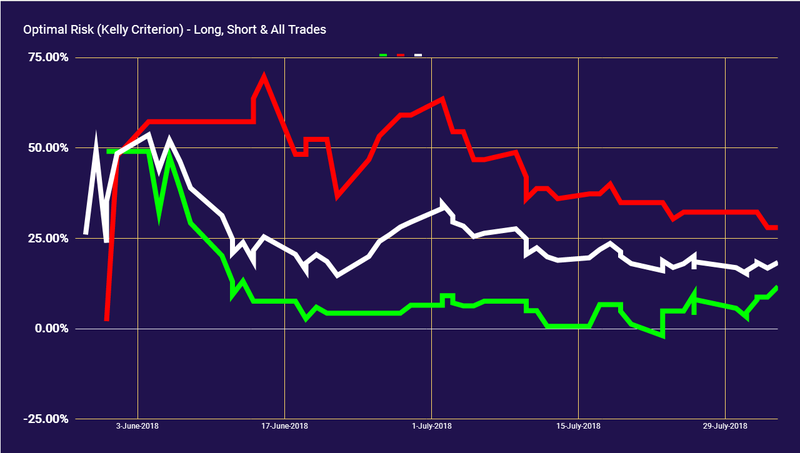 So, if I had risked accordingly on the 37 long trades and 27 short trades done between May 28 and Aug 03, and assuming that the win rate and payoff ratio would have remained the same for the longs and shorts, my Return on Capital would have been 504%. y48 is just an average trading system - profitable, but nowhere close to some of the better trading systems. However, when boosted by the steroid of Kelly Criterion, even an average trading system can give superlative returns. Are you ready to ride the highs (and the lows)? Well, my returns with the y48 system have not been as good.... but though considerably lower, they have been very very good. That is because, I obviously did not risk this exact calculated percentage of my capital (obvious, since it is a hindsight calculation). Also, I did not actually compound my capital, since I use a slightly mellower version of Money Management. And, there is small matter that I have not considered brokerage and other costs for these calculations. Those costs would have brought down the value of Optimal Risk by a couple of percentages. Today was another losing day. I don't mind such losing day's, as long as I am able to avoid disasters like on Monday. While I avoided whipsaws with the wide Stop Losses, I also missed the risky twist and turns that I could have caught otherwise. Safety first. Avoid whipsaws. Be the hunted. This is a delayed report on yesterday's trade. Went with wide mechanical Stop Losses, and that help in avoiding potentially dangerous whipsaws. But it was an unlucky day. 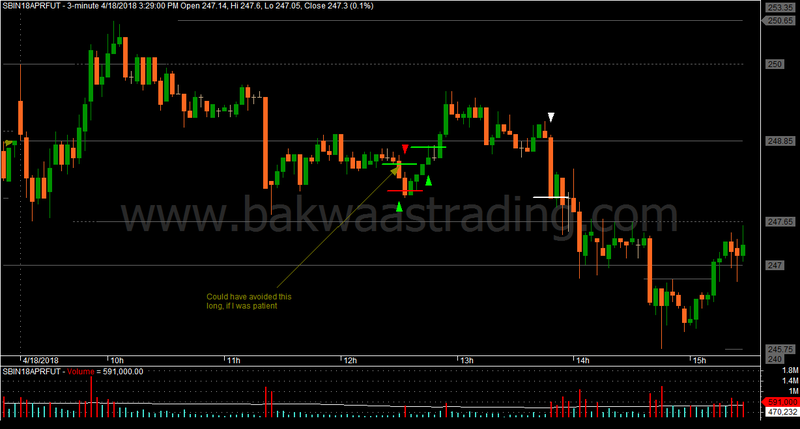 For the first trade, I got entry at the highest tick and then the price kept going down. The exit of the second trade was to be a Stop and Reverse to Long, but I got the fill only for the exit, and not for the reversal order. And then the price went up. Today was a disastrous trading day. Make this trading style Mechanical to extent possible, though this is still WIP. Wait more patiently for entries. Don't think about reducing the Initial Stop Loss. Stop trading if the Mark-to-Market is positive when a trade closes. Today, I logged in early again in an attempt to replicate my success with Opening Range Breakout yesterday. 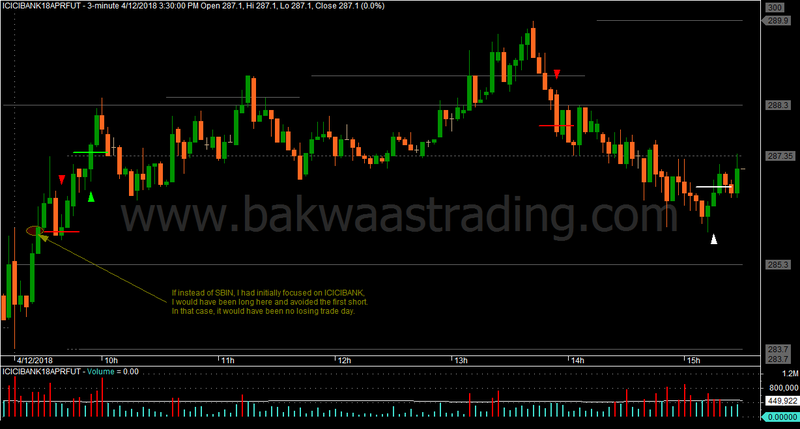 I found the opening move in State Bank Of India to be impressive, and went short with it. 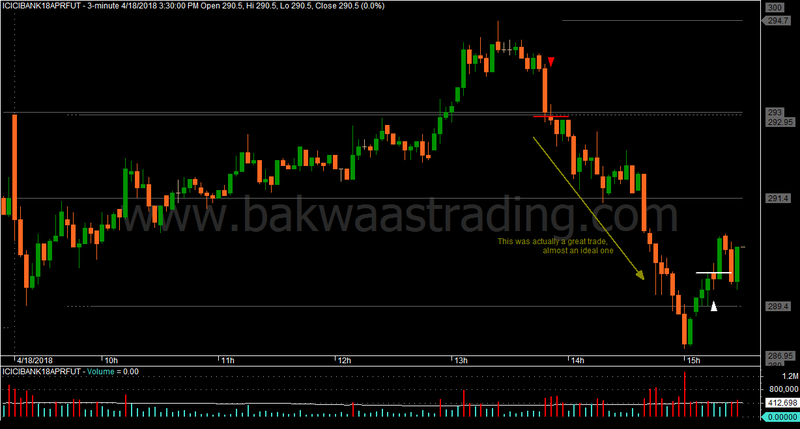 But my Initial Stop Loss was tight and got hit. I had wanted to keep a Stop-and-Reverse to long at that point, but did not have sufficient margin. Such potential early morning whipsaws are the reason why I was logging in late prior to yesterday. Anyway, if I had stayed on with State Bank Of India, I would have ridden the second breakdown successfully, but that was not to be. I was already into Hindalco. 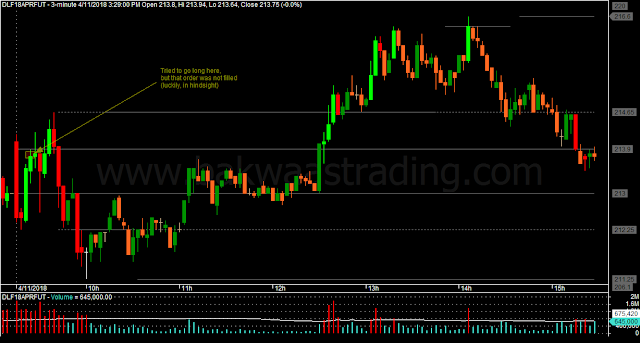 My 2 trades in Hindalco did not give me much. After that, I was back to State Bank Of India. I thought that my late short in State Bank would help me get into profits, but that was not to be. Actually, I was in profit in that trade, but the wide Trailing Stop Loss required by the One Good Trade rule, prevented locking any profits in it. Finally, I got a One Good Trade. Today, I have more than recovered from yesterday's losses. Today was a metals day (I didn't check the other commodity charts). All of them, Hindalco, Vedanta, Jindal Steel, Tata Steel - all of them were on fire. 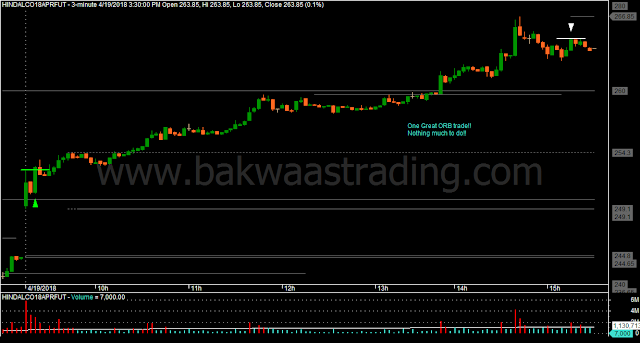 Taking a Opening Range Breakout Long trade on any one of them would have made me rich. That way, I was lucky that I chose to go with Hindalco today, instead of State Bank Of India or ICICI Bank. Also, kind of made my own luck, when I decided to switch from Nifty Futures to Stock Futures. Just look at the Nifty Futures chart today. There was no life in it. On these Stock Futures, though the Day Trading Margin Requirements are higher, the brokerage and other costs are lower per unit of volatility, when compared to the Nifty Futures. An important thing to keep in mind is the volume/liquidity of individual Stock Futures. I am satisfied with the liquidity in the scrips that I have chosen to trade so far, though many times I could not get my entry orders filled for what could have been potentially good trades. This trading style has been working so far. I guess that it will keep working.... until it stops working. 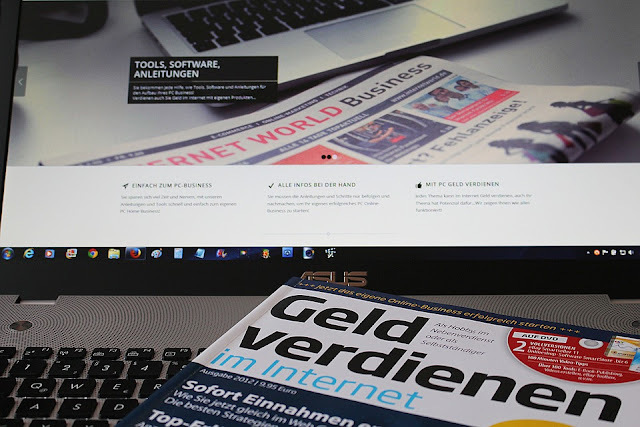 The sun is shining right now... so make hay with this trading system. Lately, I have been logging into my trading terminal a good 15-20 minutes after start of trading. It could be that I am just lazy, but I try to rationalize that due to the delay I avoid a number of early whipsaws. Today, I logged in early, just about 3 minutes after trading began. Though I liked the look of both ICICI Bank and Tata Steel, I decided that I like the pattern on the Hindalco chart better. Hindalco had a good gap up and had higher volumes. That matches the kind of better Opening Range Breakout scenarios that I was evaluating earlier. This one was a good Opening Range Breakout day, with no deep pullbacks that could take out my Trailing Stop Losses, and I only had to sit through it. 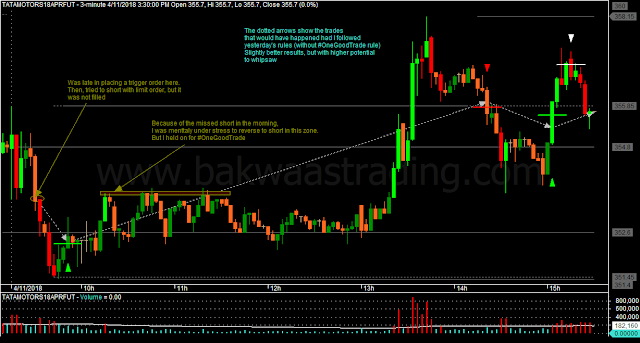 The One Good Trade rule for my Trailing Stop Loss kept it wide enough. 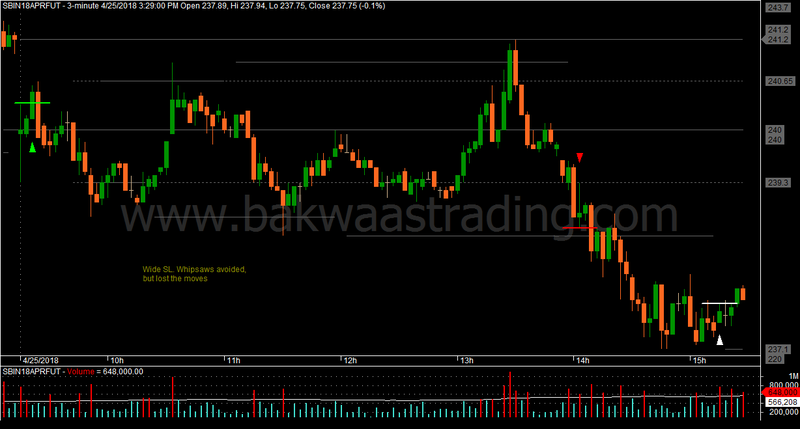 From tomorrow, I will try to log in early into my trading terminal to catch similar trades, if possible. 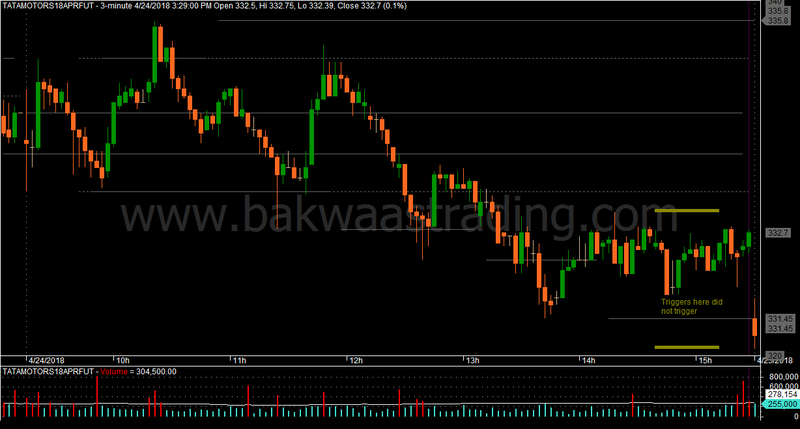 Especially, need to keep an eye on the gap ups and volumes at day open. I started experimenting with small Initial Stop Losses yesterday. Today, I continued the experiment. The experiment has given me very bad results on both days. Is the market trying to tell me something? 2 losses in HINDALCO, followed by 3 losses in SBIN. 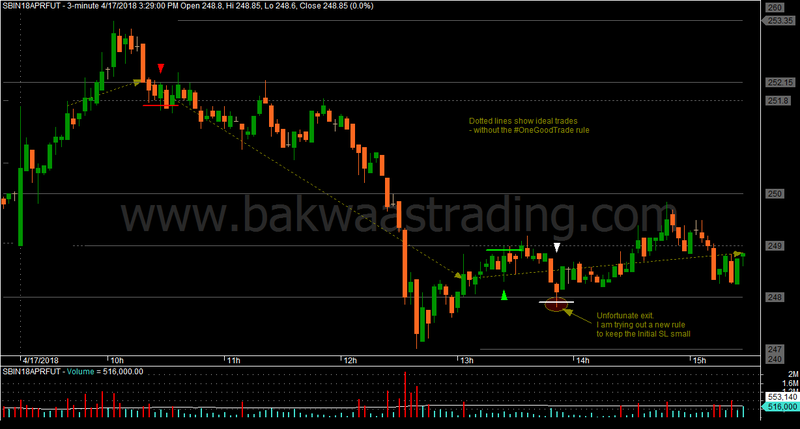 Finally, one good trade in ICICIBANK, but overall a very bad day trading day. That's trading. You win some, you lose some. You pick yourself up and then move on.... Right!!? Got back to trading after a break on Monday. Was a decent day today. 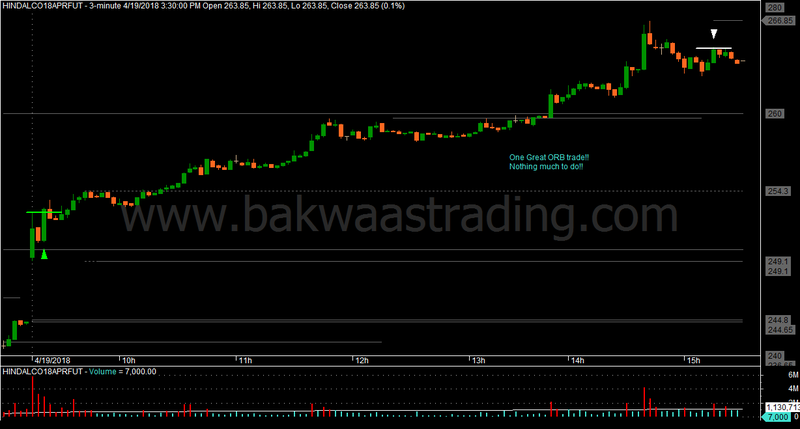 Traded two scrips - SBIN and TATAMOTORS - and managed to be in-the-money on both. Started the day with 2 trades in Tata Motors. Scratched both those trades, though there was some profit in both. After that, I thought that Tata Motors might range, and decided to wait for either a Break Out or Break Out Failure at Range Extremes. 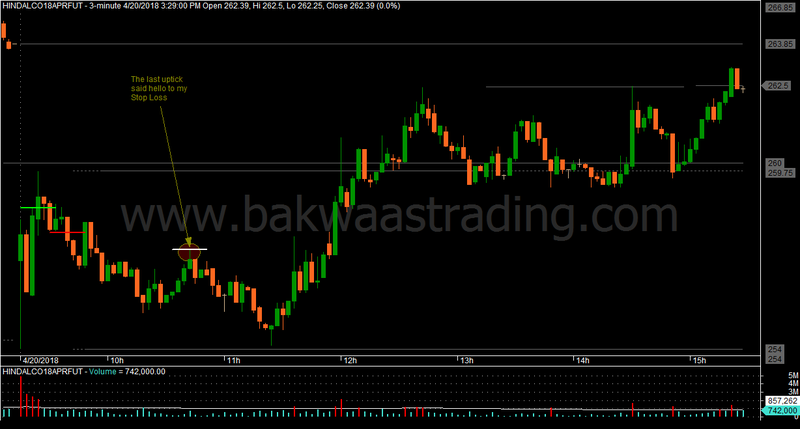 However, in the meantime, I entered short in State Bank Of India, and so missed the fall in Tata Motors. While Tata Motors fell, I was locked in my Short position in State Bank Of India, which did not move for quite sometime. But finally, it did fall, and I locked in some profit and reversed to long. I am experimenting with keeping the Initial Stop Loss small - sometimes smaller than what the One Good Trade rule would demand. 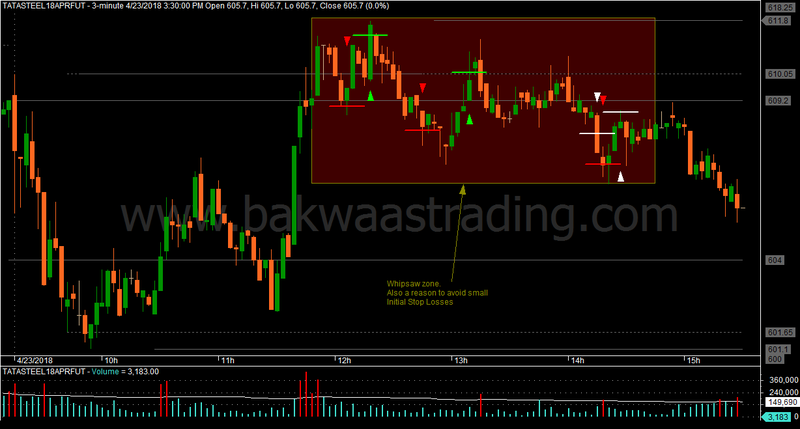 More whipsaws are expected with smaller Stop Losses, and that is what happened to my long trade in State Bank Of India. The final trade was a Long in Tata Motors above a congestion. That did not move much. 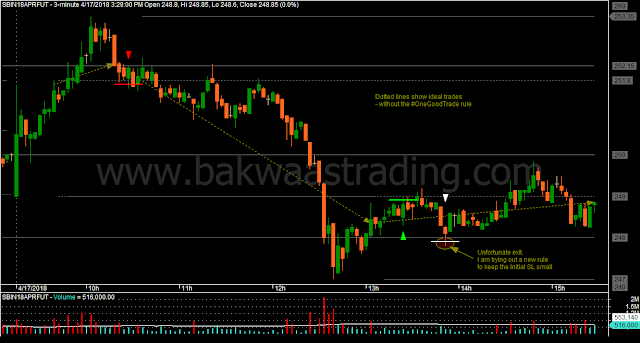 The whole of last week, I had been focusing on Trailing Stop Losses, and the result was the One Good Trade rule. While that rule has not yet caught any super duper trade for me, it has reduced the number of whipsaws and improved my performance. 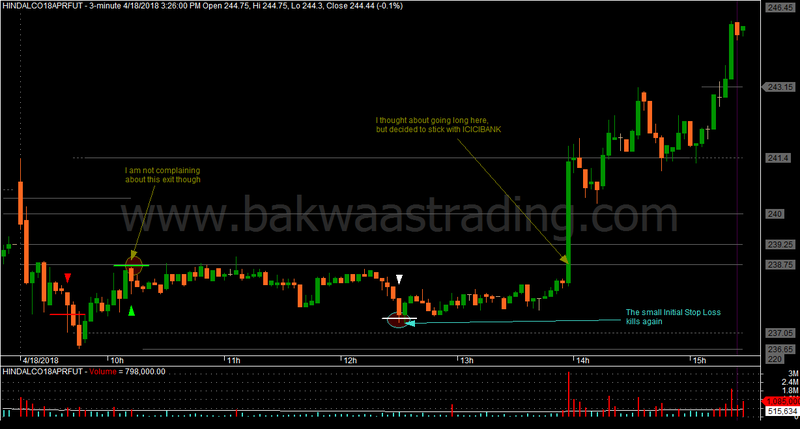 Now, I am thinking about ways to reduce the Initial Stop Loss. If a wide Initial Stop Loss is hit, it takes away a considerable part of my profits every time, and I don't like that. Now what should I do about it? Since I added the One Good Trade rule to my trading, it has been all about waiting for that One Good Trade, which may not even materialize. Yesterday and today, the day started off with losses, and the rest of the day was spent in waiting for the One Good Trade that did not materialize. It is still early days to judge the rule, but so far, it has behaved reasonably. A very big factor in the results has been luck/fate/kismet - from choosing the scrip that would move on that day (SBIN was good pick today), to being able to get a fill on the order. Today was another single scrip day for me. It started of with the bad whipsaw of 2 losses. The SAR that caused the whipsaw was particularly jarring, because the tick on which the reversal took place did not even show up on the chart. That's unfortunate, but sort of balances off against my fortune yesterday when the second trade survived by just one tick. See what I mean by luck/fate/kismet? Even then, there was particular SAR point that I was eyeing after 12:30 PM, that could have turned this into a big profit day. But I was waiting for a retest of the immediate preceding Pivot High. That did not happen. I will not be trading on Monday. I should be back on Tuesday or Wednesday next week. As the day started, I was undecided on where to take a trade. I had to choose between SBIN, ICICIBANK, VEDL and TATASTEEL. First, I attempted a short in SBIN on break of the Opening Range Low. 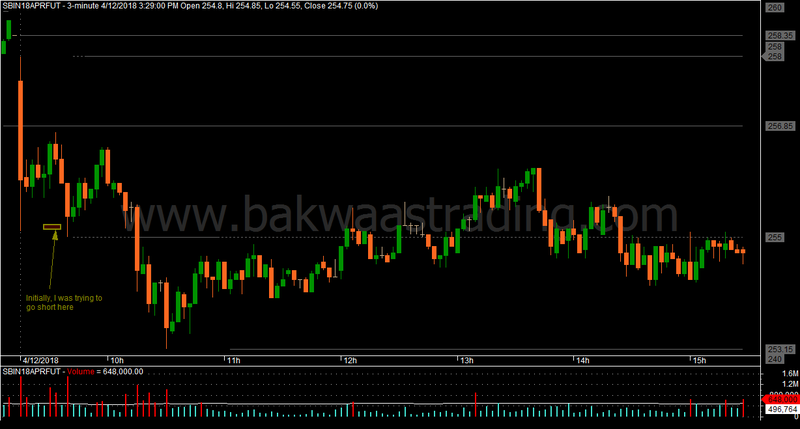 When that did not happen, I shifted focus to ICICIBANK. In hindsight, the right choice would have been VEDL, which kept falling through the day. If instead to SBIN, I had started off with ICICI, I would have gone long on the break of the Opening Range High, and avoided the losing Short trade. Also, I think that the Stop Loss on that fist Short trade was a wide, but I had to keep it there at the Day's High due of the "One Good Trade" rule. 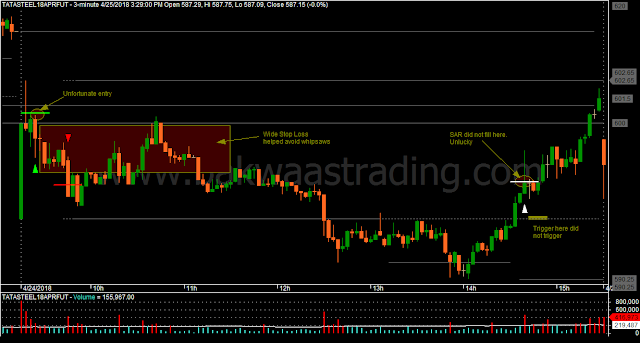 Ended with a loss, though there were opportunities to lock in a profit in subsequent trades. A new addition to my trading rules. I am calling the new rule as the "One Good Trade" rule. 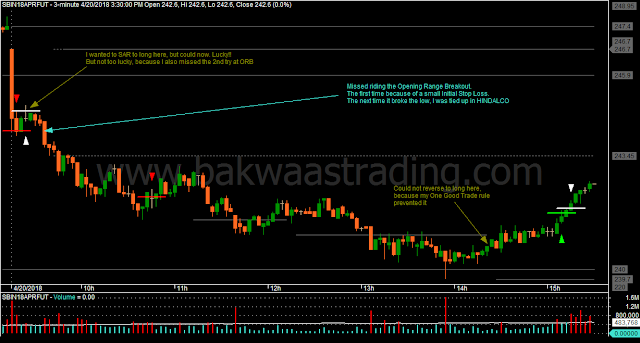 It is basically inspired by my experience in trading Opening Range Breakouts, where my aim was to try to catch the big move of the day from Day Open. That meant either no Trailing Stop Losses, or very wide Trailing Stop Losses. However, there are differences. The obvious difference is that the trades are not restricted to only Opening Range Breakouts. The entries are based on a variation of the Range Compression Trading System that I traded in Q1 2016. Plus, when compared to my trailing with the Opening Range Breakout Systems, here I do trail quite early before I relax the trailing, just to not appear stupid. So, in a way, the currently evolving trading method is a mishmash of a lot of my trading experiences. 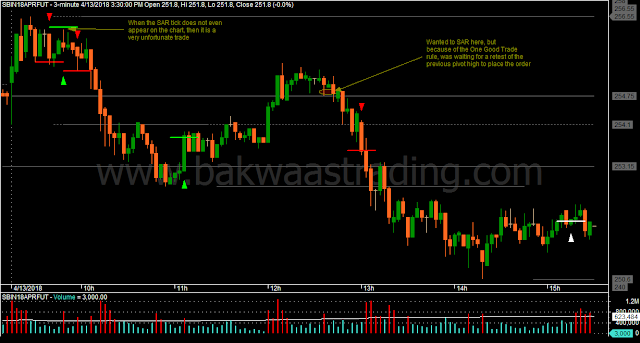 I am still getting the hang of trading Stock Futures, after having focused for long only on Nifty Futures. The current five digit price of Nifty Futures is significantly high compared to what it was a few years back, while the daily range of Nifty has remained almost the same. So, for capturing the same price movement in Nifty Futures, the cost in points has gone up, making it a big disincentive for day trading. I think that one factor affecting Nifty's movements is the fact that the gap between Option Strike Prices has remained at 50 points. 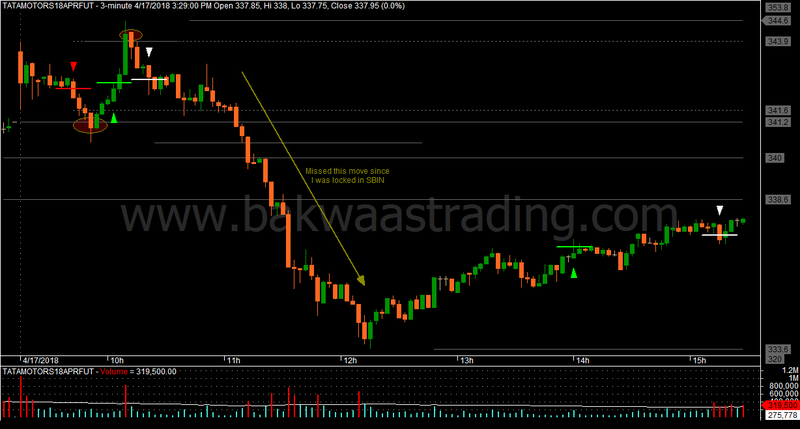 Maybe sometimes later, I will have a look at trading Nifty Options, but for now I think Stock Futures may just work out. Today, indiscipline saved me. I opened my terminal well after 9:30 AM, and liked the look of DLF, TATAMOTORS and TATASTEEL. 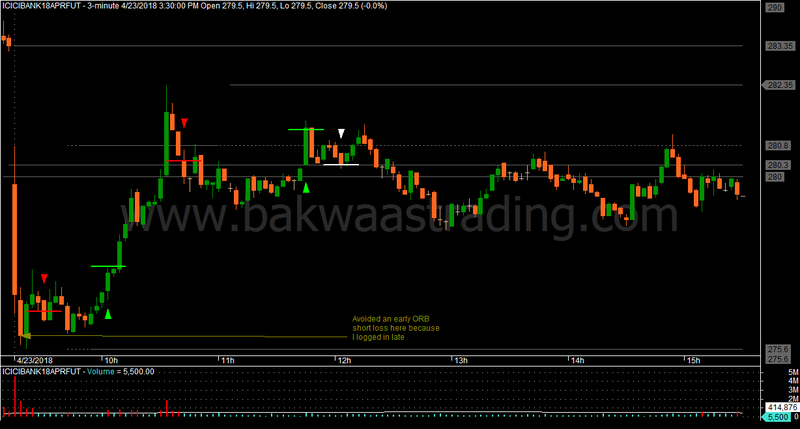 My first attempt was to go long on DLF. Luckily, that order was not filled. Then, I realized that I had missed a short in TATAMOTORS. So, I placed a Limit Short order on TATAMOTORS. Luckily, that did not trigger. With the new One Good Trade rule, that short would not have made a profit, and would have also caused me to miss the long trade. 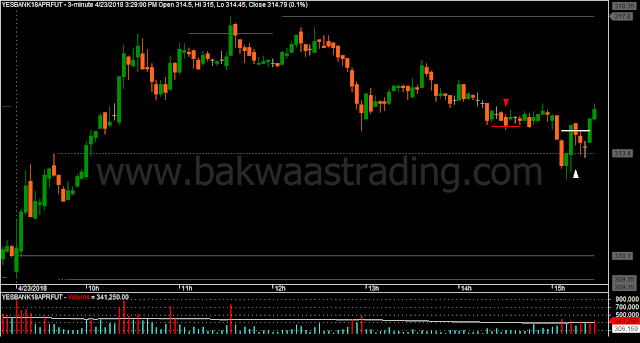 When I saw that the DLF long would have failed, I wanted to go short on DLF, but my money was already blocked in the pending TATAMOTORS order. Lucky again!! The first long on TATAMOTORS took a long time to move, but I held tight based on the One Good Trade rule. It turned out to be a good day, with all my trades being in TATAMOTORS, and no losing trades.